If you are wondering how to make a smaller diamond look bigger on your engagement ring, you're in luck. Although nothing can physically change the size other than a bigger stone, there are a few ways to create the illusion of size. This is done through carefully choosing of the size of the band, the setting, the shape, the design itself and even the colour of the metal on your band. 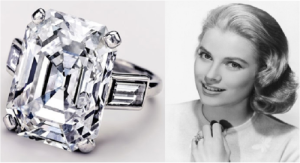 Keep reading to get our expert tips on how to make engagement ring diamonds look bigger. You can then use these tips to design your dream ring in a way that amplifies your stone to perfection. Choose a thinner band. A delicate band will make your stone appear bigger. 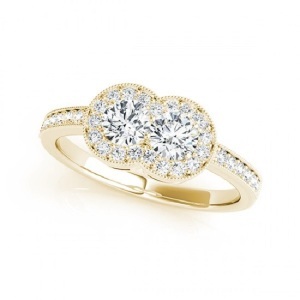 On the other hand, a thicker band may cause the centre stone to appear lost, and therefore smaller. You could opt for a split band design, or even a double banded design that frames your diamond perfectly without overshadowing it or making it appear smaller. Choose a different shape. Round diamonds show their size more than other shapes. With so many shapes available, you could take your pick from pear, marquise, oval, triangular, baguette or even a square shape such as a princess or cushion cut diamond. To get a better idea of which shapes suit your hand the best, read our guide to choosing the right ring for your finger. Choose a smaller setting. The setting itself can also change the appearance of the stone. 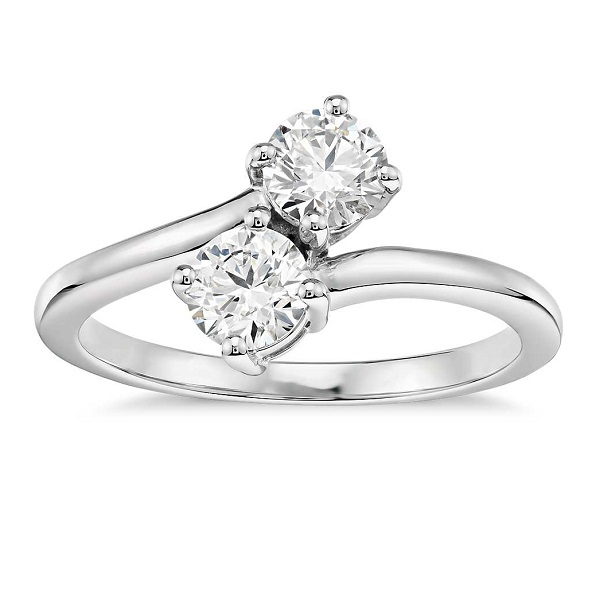 A chunky prong setting will take up space around the edge of the diamond, shrinking its appearance. When the band is also thicker, the stone will appear even tinier. A delicate four prong setting on a thin band meanwhile will help to create the illusion of a bigger diamond. Choose a halo design. Pave stones are an affordable way to add sparkle without a massive size. These work especially well around a small centre diamond. The result is a glittering ring that will catch the light at every turn, while not bankrupting you in the process. Choose a lighter band. A lighter, brighter metal can also help to make your diamond appear larger. 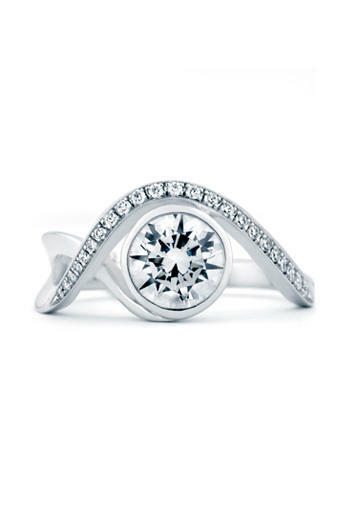 White gold is a good choice, as it is a whiter tone than platinum. A lighter shade of yellow could also work, or even a paler rose gold. 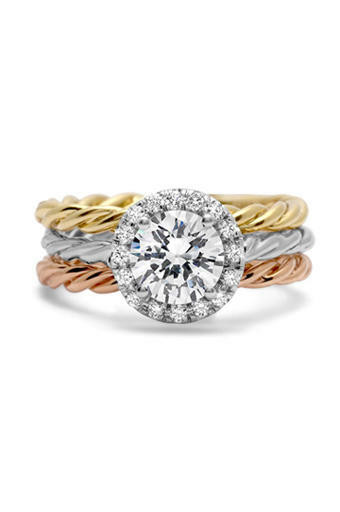 While minimal, classic and even vintage style rings may appeal to some brides-to-be, others prefer engagement rings that have more of a bold, art deco style. 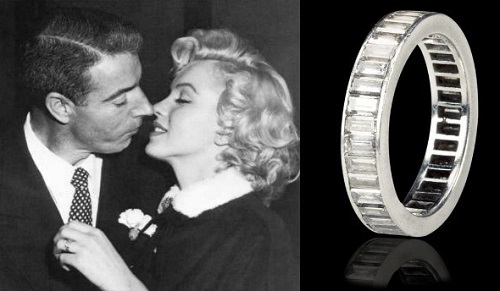 The bold look came into its own during the art deco era, but throughout history, eye-catching, beautifully ornate rings have certainly remained a constant favourite for many – especially amongst those who like to stand out from the crowd. The term art deco is one that is used to describe jewellery, clothing, décor and even architecture. It originated in Paris in the 1920s, where the term itself was coined as a result of an exhibition at the World’s Fair held in the French capital in 1925. The exhibit was called Exposition Internationale des Arts Décoratifs et Industriels Modernes (International Exposition of Modern Industrial and Decorative Arts). Around the time of the industrial era, art imitated machine, with many design trends showing this influence through designs that featured distinctive geometric shapes, symmetry and parallel lines. Art deco drew inspiration from cultures such as Egypt, Greece, Mesoamerica, Africa and East Asia, with jewellery and motifs based on shapes like circles, triangles, squares and rectangles, along with intricate geometric patterns with sharp angles, bold, rich colours, abstract elements and symmetry. While the trend itself came and went over the decades, it continues to inspire those with a creative spirit and sense of unique style. 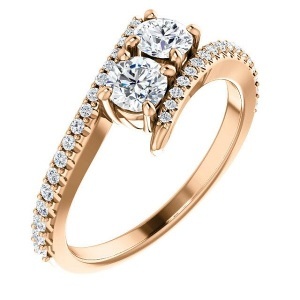 Why Consider Bolder Style Engagement Rings? Maximum visual impact. It goes without saying that eye-catching jewellery designs are noticed. 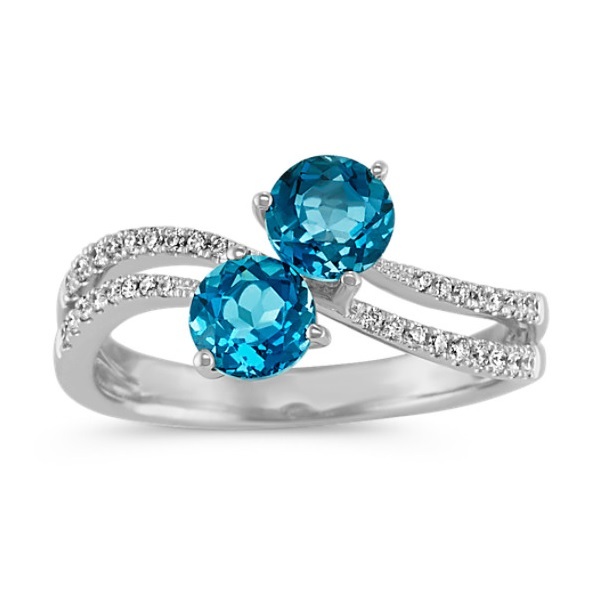 Whether you opt for colourless stones such as diamonds, or you choose something brighter and bolder, such as tanzanite, emerald or ruby, an art deco style ring is one that will be noticed, without fail. Creative and unique. The only real ‘rule’ to consider with this type of ring is making sure that it follows general art deco guidelines. That means geometric lines, sharp angles and symmetry. As far as settings, stones, band and the actual design go however, you can pretty much go as big or small as you choose, to create a ring that is truly unique. Ideal for anyone with a love for the jazz age. This style came into being during the roaring Twenties – a time known for its elegance, glamour and glitz. If you are a fan of F. Scott Fitzgerald, the jazz age or Parisian retro chic, this style is sure to be one that resonates. 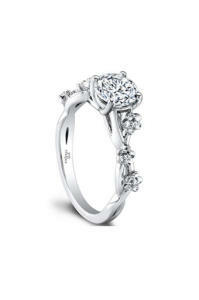 There are a few options that you may consider when choosing this type of ring for your engagement. 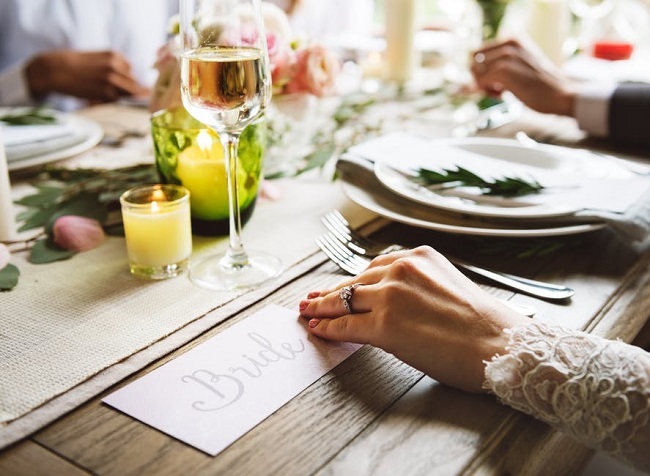 If there is an original piece within the groom’s family (or the bride’s, for that matter), you could have it restored by a professional jeweller to fix any wear and tear and make sure that it is as good as new. You could also look in books, search engines or social image bookmarking websites to find images of art deco rings to use as reference, and have your ring made from scratch by a qualified, experienced jeweller. The latter option gives you a lot more room to add your own style and personality, while also giving you full control over details such as the metal of the band, the type of stones, the setting and the overall style of the ring. 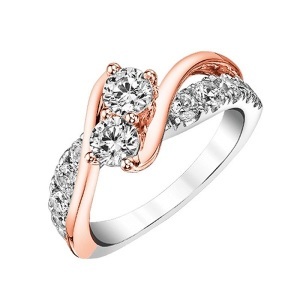 Whatever your decision may be, Cape Diamonds is here to assist with all of your engagement ring requirements. 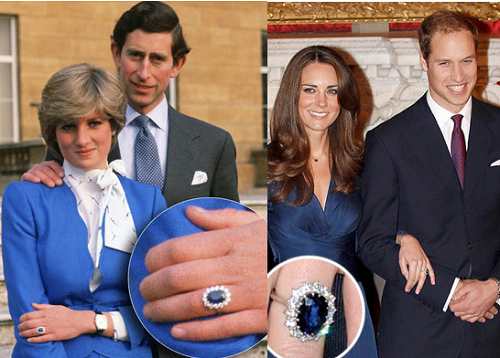 What Are Conflict-Free Engagement Rings? In addition to considering the cut, carat, colour and clarity (the 4 Cs) of diamonds, there are many other things to think about when buying engagement rings… including whether or not the ring is conflict-free. The term ‘blood diamond’ is not just the name of a movie – it is also the term used to describe diamonds that have been sourced unethically. The outcry of poor mining practices and corrupt warlords who use precious stones to fund crimes against humanity has led to an increase in standards among jewellers luckily, but it is still a good idea to ensure that your ring is certified to be 100% certain that it is indeed conflict-free. Check whether it has Kimberley Process certification. Created as a way to end the trade of conflict diamonds, the Kimberly Process was put into place by the UB in 2002. This system outlines the regulations and requirements required by countries to ensure that diamonds are mined and shipped in a humane, authentic way. Every diamond that meets these regulations will be shopped with a Kimberly Process certificate. If one is not provided, you will be unable to confirm where the stone is from and how it was mined, or whether it is sourced ethically. Make sure that your jeweller is regulated. Regulations from bodies such as the Mining Charter, which was passed by the South African government in 2008 to give more opportunity to previously disadvantaged people, will also show you whether the jeweller you use adheres to ethical practices. The Diamonds and Precious Metals Regulator will only issue permits to jewellers who comply with these regulations. Go with handmade. Another way to ensure that your ring is authentic and made according to ethical standards is to choose handmade over mass produced items. Large scale retailers rely on bulk imports and cheap labour prices, which are not always supportive to local communities or fair trade practices. Handmade rings that are made locally in South Africa, by authorised, certified goldsmiths and jewellers are far more likely to be the real deal. Better still, you will be able to trace the origins of the metal, stone and handiwork very easily, which is seldom the case with retail jewellery. Check for diamond certification. You should also be presented with a certificate when buying any item of jewellery that features a genuine diamond. When buying a ring for your engagement, be sure that you have full history and guarantee with purchase. This will provide a warranty, help with insurance and allow you to be sure where the stone comes from. Now that you have a better idea of what conflict-free engagement rings are all about, you can make your purchase with even greater peace of mind. Why Choose Handmade Engagement Rings? While at a glance it is hard to tell the difference between handmade engagement rings and store-brought, pre-cast rings, there are a number of things that ultimately determine which ring lasts the test of time. There is a common misconception that buying a custom-made ring is more expensive, and yet stores can easily charge a fortune for a ring that is not only mass produced, but also far harder to track in its authenticity and true value. A ring from a large chain store for example may have less-than-clear policies on where it sources its stones and metal. This means that there are fewer guarantees that the ring was not made in whole or part from ethical, conflict-free sources. 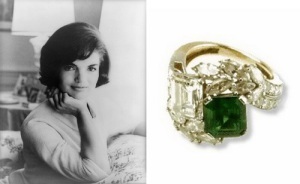 As for the mass production aspect, the ring you choose is often one of thousands exactly like it… even if you are paying a small fortune to buy it. Handmade engagement rings on the other hand offer a number of benefits that, while they might not be instantly apparent, will certainly make a difference to the wearer over the years. 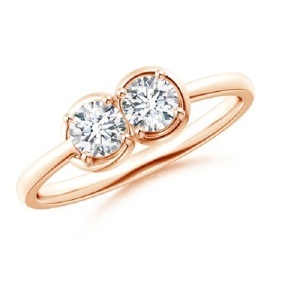 Handmade vs Pre-Cast – Which is the Best Choice for Engagement Rings? Uniqueness. We recently shared some of the most popular diamond ring cuts and styles, while also offering some insight into other factors that influence the overall look of the ring, such as the band and setting. 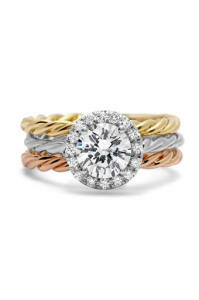 When buying a ring at a store, you would typically be shown a selection of rings, which you can then pick and choose from when you see one that stands out from the rest. A custom ring however is designed from scratch with your input provided at every stage, from the metal of the band to the size and cut of the stone, the carat, the stone itself and many other individual elements you wish to include. This means that the final ring is 100% unique, with no two rings every being the same. Value. By having full say over the ring’s specifications, you also have control over how much the final ring will cost. While you want to give your beloved a handmade ring that is as valuable as the one who wears it, you do not want to end up in debt forever after over-spending. By working with your jeweller from the initial design phase to completion, you can find a balance that is realistic and achievable. By choosing everything from the setting to the carat and the metal of the band, you will be able to plan and budget well in advance of your proposal. Integrity. 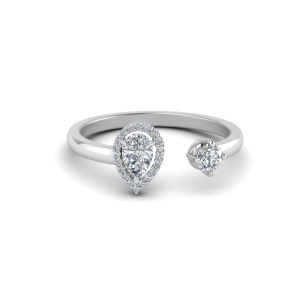 Last but certainly not least, with a handmade ring that is made by a jeweller approved by the Kimberley Certification Scheme, you will always be completely sure that you are not buying conflict diamonds. This certification was set in 2000 by Southern African diamond sourcing countries in the mining town of Kimberly, in order to find a way to end the sale of stones used to fund war, violence and other unrest. In the same year, the United Nations adopted the resolution, applying it to the control and sale of all rough diamonds sourced from this region. Without this certification, there is simply no way of knowing whether the stones in your ring have been ethically sourced or not. Rather than focusing on sales figures and profits, as, sadly, many large-scale diamond retailers have been known to do so, smaller jewellers who craft their ware by hand are committed to upholding the principles of conflict-free. At Cape Diamonds, we believe that you are not simply buying a piece of jewellery, but rather a symbol of your love that has been crafted into something unique and precious. And that is what makes the most important difference of all when deciding on which type of engagement rings you should choose. Let’s face it – purchasing engagement rings is not the easiest task on the planet. This is even truer when you are shopping in the dark, without any clue on what to look for, where to start shopping and how to be sure that you are on the right track. To make things at least a little bit simpler, we have put together some of the most important “rules” to keep in mind when you are searching for diamond engagement rings. We can’t promise that it will make the search a complete cake walk, but it will definitely give you a better idea of the things you cannot afford to overlook. Choose the ring shape and design carefully. This should not be based on rough guesses or assumptions. A good way to get an idea of the way the ring is shaped and styled is to sneak in to her jewellery box and look at the other rings she has gotten herself. Ask her friends, too. Taking some phone pictures of her rings will help provide some indication of the things she will be most likely to wear – bold, subtle, elegant, vintage or modern to name but a few typical styles. Consider the settings of the ring. The diamond is placed with a metal setting, which is then fitted to a band. There are many different options to choose for settings. Some rings only have a single stone, while others have smaller stones placed around a centre stone. Some have prongs that encase the stone; others have stones that are deeper set into the metal. Having the perfect balance in setting and shape is essential – your research in the above rule will help with this one. Know her everyday style. Going back to that research, it is also essential for you to know how she dresses on a daily basis. Look at the type of jewellery she wears. Does she wear more silver, or more gold? Is she a platinum fan, or does she opt for soft yellow gold? Look at the stones she favours too. Remember to also consider her occupation. Will the ring be practical when worn every single day, or will it get in the way? Select the right band. Then there is the band of the ring. There are many different metals to choose from, ranging in price and durability (and colour). Platinum is a popular choice, as it is a pure metal that is hypoallergenic and very durable, making it ideal for those with sensitive skin. Remember that often wedding bands will match the engagement ring, which means that you will wear a similar ring in the same metal. Make sure you plan ahead and be patient. The creation of a ring is not to be rushed, and can take a few weeks at the very least if you are having it custom made. Make sure that you have ample time when planning your proposal, so that you do not have an awkward wait to get the ring. You will also need to inform your jeweller of any inscriptions if you want them engraved inside the ring band too. Keep these simple rules in place when shopping for engagement rings and you are sure to be on the right track in choosing a ring that will be as perfect as the one you are proposing to. When the time comes to start looking at engagement rings, many men are stumped at how to even begin making the right choice. While much depends on your budget, the future life partner and individual taste, if you are planning to give a loved one a diamond and pop the question, a good way to get started on finding that perfect ring is to follow the 4 Cs approach. This system is used in the diamond industry, where many different diamond characteristics are graded and categorised. The 4 Cs comprise the most important characteristics when determining the value of a diamond – Cut, Clarity, Colour and Carat. There’s also a lesser known but still important 5th C, which is Certification. 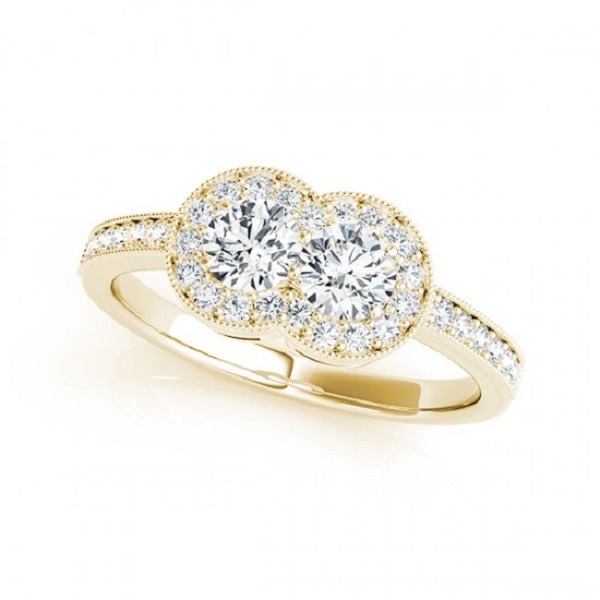 What do all of these mean when it comes to choosing engagement rings that feature diamonds? 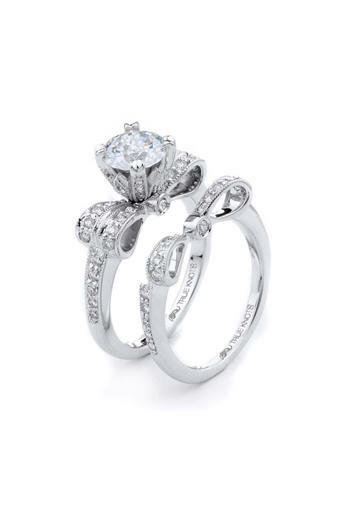 Here’s what you should know about characteristics of diamond rings. This refers to the shape and style of the diamond. There are many different cuts, ranging from square to round, with each cut determining just how much sparkle the diamond has when placed within the ring. Simpler cuts are always a timeless choice, while elaborate cuts that allow the full brilliance of the stone to shine are bold, beautiful and sure to make a statement. Almost every diamond has some flaw that occurs when the stone is formed, and this is what makes each stone unique. Generally speaking however, the clearer the diamond, the more it shines and the more it costs. The visibility, number and size of the flaws all help to determine the clarity. Even though clear stones are valued highly, there are many levels of clarity that ensure plenty of choice and variety. After all, sometimes the tiny imperfections in stones (and people) can be more alluring than pure perfection. Diamonds with no colour allow the most reflection of light, which gives the stone that all-important sparkle. When a stone is off white, it absorbs more light, which in turn reduces the level of light that shines off the facets of the stone. 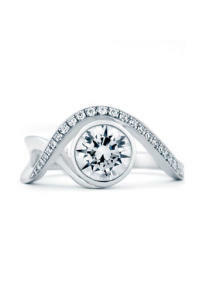 Colourless diamonds are especially brilliant in a cut that maximises the shine of the natural light that is refracted. This is often the thing that most people know about diamonds, especially when it comes to determining the value of a stone. As the unit of weight that diamonds are measured, this refers to the value of the stone as well as the size. Larger diamonds are much rarer than smaller diamonds, meaning that the larger stones are more valued, and therefore more expensive, too. Then, there is the 5th C that is often overlooked but should also be a vital part of any purchasing decision. This C refers to the certificate (also known as a grading report) that evaluates the diamond. 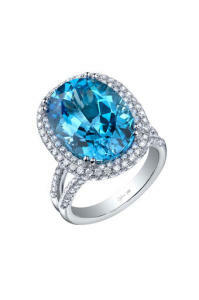 This grading is done by a qualified expert, using special instruments used to evaluate gems. As each stone is unique, with its own individual qualities, listing the stone’s characteristics in an official certificate helps to ensure that you are buying the real deal. It is also essential for insurance purposes. Now that you have a better idea of how to set off on your mission to find the perfect ring, have a look at our tips on the symbolism of engagement rings to find more advice on fine-tuning your search.